Salam. I wanted to share this brief point about the blessed green dome of the Masjid al-Nabawi al-Sharif, from Sh. Mamduh’s book ‘Kashf al-Satoor’ (p.99-100). I have summarised his points which Inshallah (it is hoped) will be of benefit and clarify any misunderstandings. 1- It is an accepted fact that the Prophet (Alah bless Him and give Him peace) was buried in His chamber which possessed a roof. Likewise His two companions (Allah be pleased with them) were buried next to Him in the room under this roof. 2- There is no significant difference between a roof and a dome, as every dome is form of roof covering, but not every roof is a dome. Therefore a dome has a specific distinguishing quality which can be seen by all. There is no evidence in the sacred law, whether explicit or indirect which points towards the forbiddance of building a dome on top of the roof. Therefore when the blessed chamber became encompassed within the masjid, there occurred the existence of the roof of the chamber below the roof of the masjid, or that the roof of the masjid was the same as the roof of the chamber. All of this took place during the time of the salaf, and with the agreement of all of the muslims despite their differing schools of belief and law down the ages of Islamic history. This is therefore counted as being a strong consensus which clearly points to permissibility of burial within a building. 3- In the year 678 Hijri, during the reign of al-Mansur Qalawan al-Salihi, a dome was constructed on the highest roof of the masjid al-Nabawi in line with the blessed chamber, in order to differentiate the blessed chamber from the rest of the masjid. Importantly it is not recorded that any of the people of knowledge at that time condemned the construction of this dome nor viewed it to be shirk, kufr, bidah or the making a grave into a masjid. However the answer to any objections is that the Prophet (Allah bless Him and give Him peace) and His companions were buried in a roofed chamber by His order. 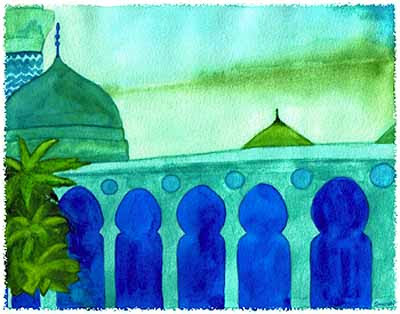 The muslim community (ummah) unanimously agreed that this roofed chamber be entered within the masjid, therefore to distinguish one part of the roof from the other by painting or forming a dome is permissible as there is no evidence which points to it being disliked let alone unlawful (haram), not least when it is on the chamber and not on the grave itself. Allamah Ibn Taymiyyah also may have written something against the construction of domes over graves, however it is not clear from Sh. Mamduh’s words whether he wrote specifically about the blessed dome of Masjid al-Nabawi al-Sharif or not.